This ready-made maths resource collection 3-4yrs is well stocked with small resources to encourage discussion about size, shape and quantity – building a great range of vocabulary. Games boards, number cards and dice provide opportunities for number recognition. 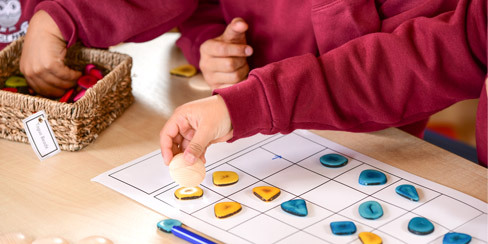 Exploring number through hands on, open-ended activities and games brings maths to life. 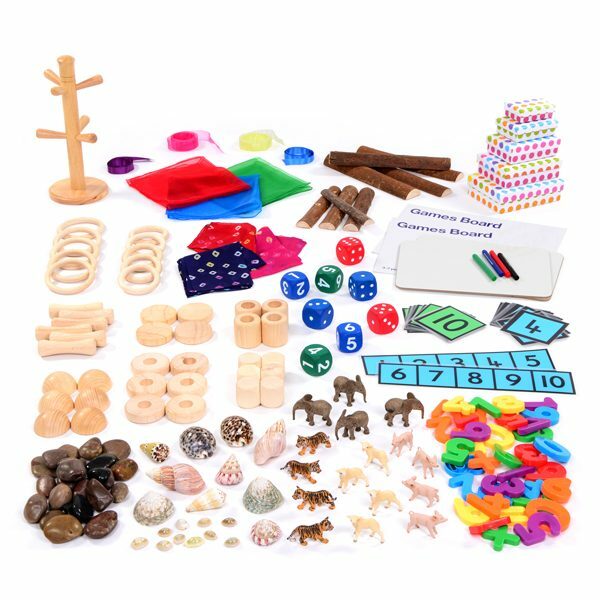 Although challenging to get right, a carefully planned maths area provides a wide range of natural resources to sort, match, order and compare as well as lots of equipment to learn about number through games, rhymes and songs. With encouragement and support, children will soon know how to use the maths resource collection 3-4yrs independently and become engaged in meaningful experiences that lay down strong foundations for later learning. Set of Number Lines & Cards– Set of green and blue number cards 0-10 and blue number line 1-5 and 6-10. 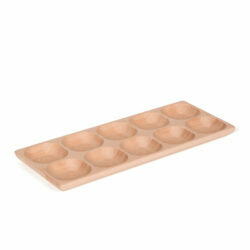 Using this selection of number cards and lines will help children to recognise numbers and begin to order them. Set of Whiteboards and Pens – 2 x A4 Whiteboards and 4 x Mini Whiteboard Pens in red, black, green and blue– This set of whiteboards enable children to record and tally information such as measurements, calculations and tally’s. 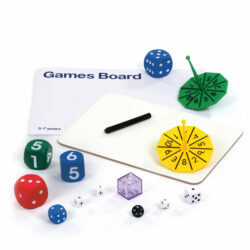 Set of Games Boards – 2 x Games Boards – these games boards include a plain grid enclosed which can be used to design any number of simple games. Set of Jumbo Dice – 2 x blue spot dice, 2 x red spot dice, 2 x green number dice and 2 x blue number dice. Set of Small World – 4 x Mini Elephant, 4 x Mini Lion Cub, 4 x Mini Lambs and 4 x Mini Piglets. Set of 4 Graduated Nesting Boxes – These colourful spotty boxes are ideal for sorting or storage. Set of Shells – Set of large shells including cone shells, Japanese land snail shells, strawberry troca shells and tiger cowrie shells. 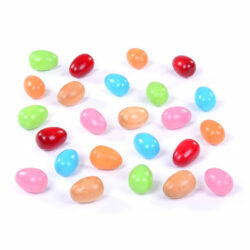 Set of 10 mini cowrie shells. 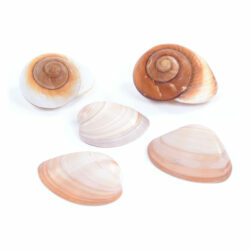 These beautifully patterned shells can be used for counting and sorting. Set of Ribbons – Set of 4 ribbons 15mm x 2m in a range of colours. Set of Scarves – including 3 patterned scarves and 3 plain sheer scarves. Set of Half Logs – 4 x 20cm and 4 x 27cm. Set of Wooden Objects – 6 x small spools, 6 x small cubes, 4 x wooden reels, 6 x small discs with hole, 4 x small discs, 6 x wooden Semispheres, 5 x small wooden rings and 5 x large wooden rings.